Originally published under the title "Ben Rhodes's Fiction Behind the 'Iran Deal'." 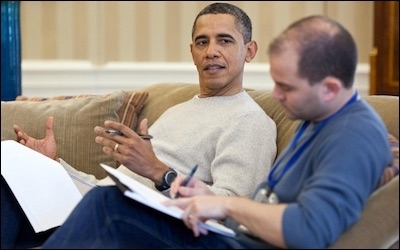 President Barack Obama works on a speech with Deputy National Security Advisor for Strategic Communications Ben Rhodes. That the Obama administration's Iran deal is a work of fiction has been known all along, but now Deputy National Security Advisor for Strategic Communications Ben Rhodes is taking credit as its author. In a long interview with New York Times reporter David Samuels on Sunday, the world learned that Rhodes is "the master shaper and retailer of Obama's foreign policy narratives" who "strategized and ran the successful Iran-deal messaging campaign." Samuels lauds Rhodes as "a storyteller who uses a writer's tools to advance an agenda packaged as politics." Rhodes acknowledges that there is nothing 'moderate' about Rouhani, Zarif, or Khamenei. In the midst of his fawning profile, Samuels exposes a number of lies behind the Iran narrative, or rather quotes Rhodes himself doing so. For instance, the first outreach to Iran came in 2012, not in 2013. I'd bet it came even earlier. Rhodes even acknowledges that there is nothing "moderate" about Iranian leaders Rouhani, Zarif, or Khamenei. But these dates and facts conflicted with the narrative, so they were finessed, rewritten, and sold to the public with different plot lines and different themes. Outside Washington, DC, this behavior is sometimes called lying. The Rhodes narrative, at its core, is a simple tale in which a hero, armed with special skills and weapons, goes on a quest that requires a fight against the forces of evil. It incorporates elements of the ancient epic, the medieval romance, and the eighteenth-century novel, with elements of drama splashed in here and there. 'Framing the deal as a choice between peace and war was Rhodes's go-to move,' the New York Times reports. Rhodes is proud of the way he manipulated a gullible media into buying the administration's Iran narrative.